This is Monument Cove, along Ocean Drive in Acadia National Park. This spot is named for its vertical sea stack of granite isolated from the cliff by coastal erosion. I think it’s one of the most iconic scenes in Acadia National Park. Granted, it’s not as impressive as the monuments out west, but how many of those are bordered by the ocean? In the distance is Otter Cliff, another popular spot in Acadia. We only had two sunrises and two sunsets in Acadia National Park, and the original goal was to hit Cadillac Mountain for the second sunrise doing Bass Harbor Head Light for the first sunrise. Unfortunately, with the government shutdown, getting to Cadillac Mountain would have been a long hike in the dark (rather than a drive and a short hike, as it would normally be) and I was a little apprehensive about doing that since I was by myself. Instead, I opted for Monument Cove. I had seen it in Ultimate Acadia (this is a nice, concise guide to Acadia; better than the overly long Moon Handbook we also got), and thought it would be an interesting view that’s distinctly Acadia, rather than “generic” oceanfront. Also, it was a much shorter hike from the barricades, and all along a well-maintained trail right beside Ocean Drive. My impression is that this isn’t normally a popular sunrise spot even when the park is open, so I was a little surprised when a couple of Russian guys approached me in the dark as I was getting set up here! I was lucky to beat them to my exact spot, which was the “best” view of the rock formation on Monument Cove. There was literally only room for one tripod in a small clearing on the cliff where I was standing (part of the reason I suspect it’s not a popular spot). They managed to find other spots and we chatted for a while, but it did seem humorous to me that the three of us were all right there when there was probably no one else in Acadia remotely close to us. In the end, I regret not just trying to do the hike up to Cadillac Mountain. I usually make suspect decisions that reap big dividends, and I think this would have fit that mould. At this time of year, Cadillac Mountain is the first spot to see the sunrise in the United States, and given the hike in the dark required with Acadia closed, I’m guessing that no one was up there (normally, it’s busy). I think it would have been pretty awesome bragging rights to say, “today, I was the first person in the United States to see the sunrise.” Then again, I’m into sort of meaningless bragging rights! Out of all of the trips we’ve taken this year, oddly enough, this is the trip booked furthest in advance. I’ve wanted to go to Acadia National Park for a few years, but airfare into Portland, Maine (or Bar Harbor) has always been cost prohibitive. Earlier in the year, I got an alert from Airfarewatchdog that it was less than $200 round trip, so we promptly booked. Sarah wasn’t too enthusiastic about going, but since she flies free whenever I fly (thanks to a Southwest Companion Pass) and I’d be paying for accommodations anyway, it seemed silly for her not to go. I was finally able to convince her with one thing: lobster. Or should I say, “lobstah,” because apparently that’s how it’s spelled in Maine. We had lobstah for ever meal in Maine, including breakfast. Who knew that Lobstah Eggs Benedict and Lobstah Omelettes could be so good?! What really impressed me was all of the great lobstah pounds that were seemingly in the middle of nowhere. We’d drive down small country roads where virtually no one lived, only to be greeted by incredibly busy restaurants at the end of the drive. It was almost as if the crowds materialized out of nowhere. Overall, I really liked Maine, and a big part of that was due to the great food. 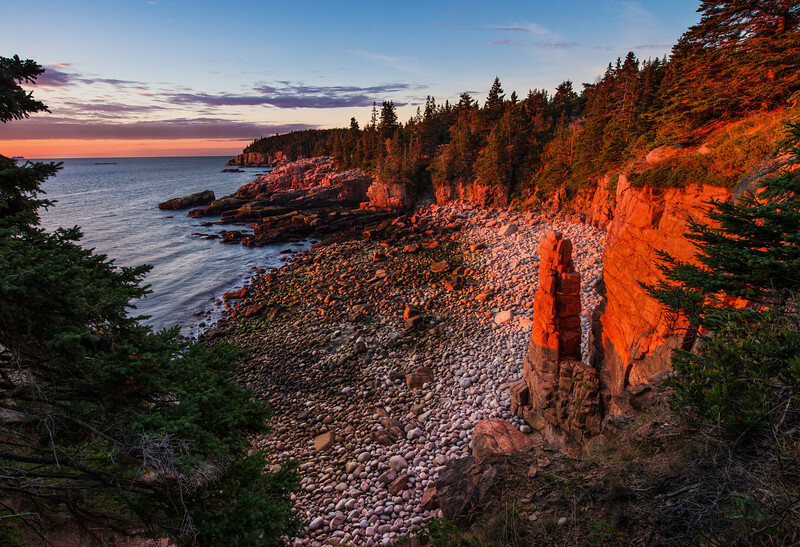 This shot of Acadia National Park was photographed with a Nikon D600 and the Nikon 14-24mm f/2.8. For kicks, I initially did HDR processing in Photomatix. For some reason, the photo that saved didn’t match my input settings. I have no idea why, but I kept reprocessing it, and it kept looking totally different when I saved it. I don’t use Photomatix much, but I’ve never had this happen before (anyone know why it might’ve happen?). I got fed up with this, so I decided to give up. I still used the photo it was producing, I just layered it with my normal photo at only 15%…so there are slight touches of it in there, but it shouldn’t be too noticeable. When I do HDR, this is usually the route I go, but usually the tonemapped layer is about 33% to 49% opacity. I try to never exceed 50% opacity, because that’s when I think the photo starts exhibiting the telltale signs of HDR. It’s not like my normal editing style is photo-realistic, but I don’t like to go too far across the line. I did all of this Photoshop CS6, layering my tonemapped image on top of my evening exposure and adjusting the opacity. I also did several color balance adjustment layers in an attempt to get the colors of the kiss of the morning sun on the sea stack correct. I always have a tough time with this, and I hope you don’t notice color bleed. I hate when that happens. Finally, I added a curves adjustment to make the photo pop a bit more. Would you have hiked to Cadillac Mountain for the “bragging rights” of being the first person in the US to see the sunrise? What do you think of Maine Lobstah? Please share any of your thoughts on these things (or other topics) in the comments! The eBook is 51 pages long, featuring 75 photos, and (obviously) 101 things to do in Southern California. If you want a copy of this totally free 101 Things to Do in Southern California eBook, all you need to do is subscribe to our newsletter and you will receive a link to download the eBook.